We’ve started our review course for the MCAT. I wrote about the MCAT back in October, where I attempted to defuse my fear surrounding the test by referring to it as an actual cat. Unfortunately, I have to treat it like a real thing now, with books and studying and practice tes- oops, I just vomited a little bit. The overwhelming scent of failure is nauseating. 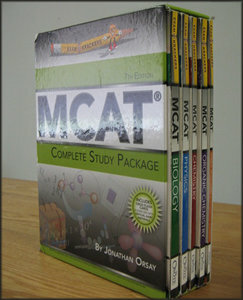 If you remember the SAT Subject Tests, the MCAT is sort of like 5 subject tests all mashed together. It covers general chemistry, organic chemistry, physics, biology, and verbal reasoning/essay-writing. It’s about five hours long, computer-based, and evil. By the way, why is the reading comprehension section always referred to as “verbal reasoning?” There’s no verbalizing involved, and often no reasoning either. Note that it actually consists of five separate books, all shrink-wrapped. My Exam Krackers study guide occupies a place of prominence in my apartment, located on an end table directly opposite my apartment door. So I see it every time I come home, reminding me of what’s coming. Yesterday, I threw my rain jacket over it, because it doesn’t exist if I can’t see it. It’s still shrink-wrapped. I figure until I am forced to open it, I’m not actually studying for the MCAT yet, meaning I don’t yet meet the definition of “clinical depression with obsessive-compulsive features.” Anyone with a Zoloft prescription, let’s talk. I’m writing this because I learned yesterday that the MCAT, starting in 2015, is getting a makeover. The MCAT’s job is to provide an indicator of the ability to succeed in medical school, especially during the class-heavy first two years. So periodically, People Who Care do some studies, ask a few People Who Matter (hint: not premedical students) and adjust the test. In the new version, gone is the writing section; it turns out that your essay grade has zero bearing whatsoever on your success or failure as a medical student. Why? I have no idea. If you insist on an 11-point writing test, why not go 4-15 and make the aggregate score out of 65 instead of 45? Actually, why is the test out of 45 to begin with instead of, say, 100? I don’t know that either. I’m not sure anyone does. It’s completely made up. Apparently an essay grade of “P” or “Q” tends to be good enough, which if you’re counting letters is about halfway from J to T.
Maybe this was too random, even for the AAMC. So they’re getting rid of it. In fact, this makes perfect sense, since you never have to write essays in nephrology class anyway and no standardized test essay is truly representative of someone’s ability to write. If you took the new SAT, or an AP English exam, or any kind of mass test with an essay, you know this is true – in reviewing for the test, you probably learned a specific formula to follow. By simply copying that formula onto your essay paper, you usually were guaranteed a pretty good grade since a standard grading rubric is by definition rigid. I vividly remember rebelling against the Kaplan SAT tutor, poor guy, because I was pissed off about having to write a hamburger essay (intro paragraph! body paragraph 1! body paragraph 2! body paragraph 3! concluding paragraph beginning with “in conclusion!” AHHHH KILL ME). The goal here, evidently, is to admit future doctors with some semblance of actual social skills and the ability to empathize with patients instead of just analyze their labs. Sounds good to me. On a fair number of occasions, I’ve come across a med student who had the social tact of a hamster, though he or she could recite the anatomy of a kidney on cue before scurrying back out of the light. One medical school admissions officer was quoted as saying this will encourage people in the humanities to apply to med school, a current idea to improve the quality of doctors. I’m not sure I’m buying his argument – the burden of the science classes isn’t reduced any, and I can safely speak from experience when I say it’s hard enough as it is.